Dwarf Mbuna are an ideal Mbuna for the hobbyist that hasn't got the space for a large tank or the funds to buy large tank. Dwarf Mbuna can also make a stunning 1 species tank. Dwarf Mbuna will max out at around 4" in length. We should be turning the volume of water over a minimum of 5-7 times per hour. I recommend using external filters/canisters or a sump. 300w heaters will heat the water quicker and will be more cost efficient. Having 2 heaters will give you peace of mind if one happens to fail the other one will kick in - Have one set at a slightly lower temp. Both of these are a must! Water movement: Can be achieved by using the filters outlets and the use of either a wavemaker or powerhead. Wavemakers can also be used for pushing waste towards the filters inlets. Substrate: Mbuna will sift and dig breeding pits so try and avoid large gravel type substrate. Recommended Substrate: 1-5mm: Coral Sand (pH buffer) Play sand, Pool filter sand, CaribSea Eco-Complete African Cichlid. Remember to move the substrate around on a weekly basis to release nasty gases that build up. Rocks: Mbuna are mostly Rock Dwelling. Examples of rocks to use: River Rock, Cobbles, Ocean Rock, Texas holy rock, chunks of slate. Try not use rocks that are porous as they could possibly leech unwanted chemicals in to the water. If you're unsure if the rock is not porous pour some white vinegar over the rock/s and if it fizzes avoid using it. Is down to personal preference. I've found that using Marine white and Marine Blue (10k - 14k) really make African Cichlid colours pop. Remember Mbuna do better in an overstocked environment - This spreads out aggression - But saying that! Just because a fish fits in a tank doesn't mean it's right. An experienced African Cichlid Keeper will be able to judge if the tank if over stocked or understocked. Always try and have a higher ratio of females to male of the same species. Here's a recommended stock ratio to volume guide (This is just a general starting guide) Ratio will go up due to volume and the tanks footprint increasing. Easiest tip I can give: Stay away from species that have similar looking males and females. For example most of the Afra species have very similar looking females - stocking multiple species of Afra with similar looking females can result in possible cross breeding. A quality vegetable flake food (like those containing Spirulina) by itself is all that's needed. . Spirulina is an excellent source of Phycocyanin, which is the blue pigment derived from blue-green algae, but for yellow or red fishes to show their best colour, additional vitamin sources must be provided. Furthermore, fish fed too much Spirulina, may in fact develop dark, irregular spots or stains along their sides, called Spirulina spots. Keep the food high in fibre and low in proteins. Let algae grow on your rocks - Mbuna will graze on it just like in the wild. New Era, New Life Spectrum, Hikari, Dainichi are among the best manufactures of African Cichlid food. 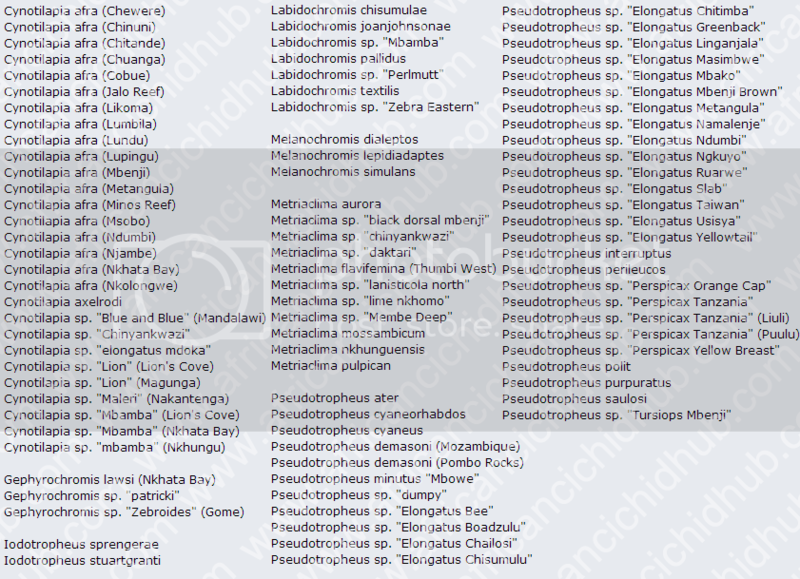 Below is growing list of Dwarf Mbuna Species (I would like to thank Kevin Michiels for his involvement in compiling this list) If you would like to contribute more species please contact a member of the ACH team. Copyright - If you wish to use the "Dwarf Mbuna List" please refer back to this forum topic.